Our Swiss Princess Cut Cubic Zirconia Tennis Bracelet is reminiscent of the famous swiss watch link. It features solid gold rolling links with a single row of channel set princess cut cubic zirconia stones totaling 5 carats of the finest hand cut and hand polished original Russian formula cubic zirconia. 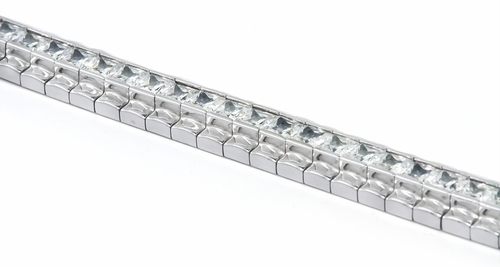 This channel set princess cut line bracelet Comes standard 7 inches in length and an upgrade to an 8 inch is offered. Choose from 14k white gold or 14k yellow gold. Please see the pull down menu for options. For further assistance, please contact us directly at 1-866-942-6663 or visit us via live chat and speak with a knowledgeable representative.